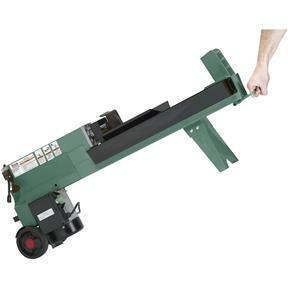 This Hydraulic/Electric Log Splitter features a 1-3/4 HP, 110V Motor, 5 tons of hydraulic pressure and built-in wheels and handles for portability. 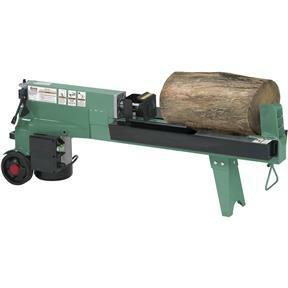 Handles logs from 15" - 20" long and up to 10" in diameter. Ideal size for wood stoves with short fire boxes. I purchased this model after seeing one in use. Works much better than expected. Delivery was excellent. The only issue I've had is the wheels are too small and the spacing make it difficult to traverse uneven ground. The experience was so horrible I used the splitter on 2 logs just to make sure it worked then covered it. 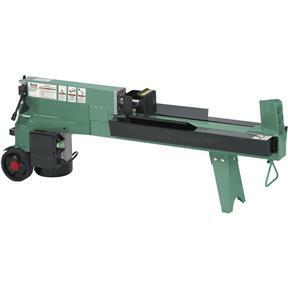 I have purchased a table saw, drill press, planner, dust collector and had problems. The splitter will the last attempt on allowing them to dissappoint me. My Grizzly log splitter is unbelievable!. I wouldn't give it up for any of the "Big Boy" machines. This log splitter is the greatest and I've been demonstrating it to everyone. They just can't believe the power this little GIANT has! I just love it.